Delphinium (larkspur) plants, seeds, flowers for sale in the UK include British Elatum Hybrid Delphiniums, and NZ hybrid Delphiniums (Dowdeswells delphiniums). 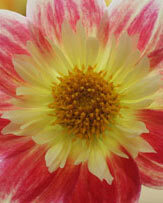 They are grown for their tall flowers during summer are an instant eye-catcher in the border. And as for flower colors, Delphiniums are available in the usual light and dark blues, plus whites, pinks and more. 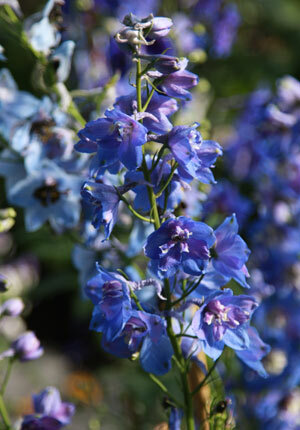 Delphiniums are available for sale from specialist Delphinium nurseries as plants or why not buy seeds. Although seen as a cottage garden plant, some of the new lower growing or dwarf cultivars are well suited to growing in containers. Delphiniums grow best in a humus rich soil and taller delphiniums may need staking. 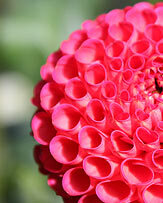 Remove old flower heads and with a little luck delphiniums may give a second flush of flowers. Make sure that you choose a position that is well drained during winter so that the Delphinium crowns do not rot during dormancy. 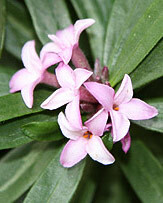 Once plants begin to show signs of life in spring you will need to protect them from slugs. Remember that most varieties will require staking. Good air circulation will alleviate many of the fungal problems. Use a liquid seaweed fertilizer along with some blood and bone from spring though to autumn. Includes: Delphinium 'Blue Butterfly' , Delphinium requienii. Rare delphiniums from cuttings supplied direct to the gardener. New millennium Delphiniums, New Zealand Hybrid Delphiniums, photos, cultivation notes and the opportunity to buy delphinium seed for these glorious English hybrid type elatum delphiniums. 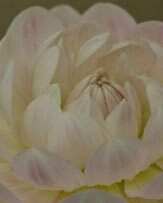 Mail order nursery supplying. Elatum Hybrid English bred Delphiniums. English classic highly scented Perpetual Flowering Carnations. 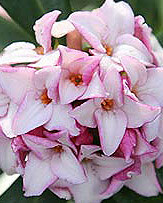 Old and modern scented Pinks. Free catalogue on request.